The UNM Center on Aging and the UNM Division of Geriatrics have created an educational infrastructure that is penetrating all levels of medical education and it is using existing networks to provide geriatric education to physicians and practices statewide. The UNM Center on Aging has been reinvigorated by support from the Donald W. Reynolds Foundation Geriatric Medicine Next Steps Training Grant to improve interprofessional geriatric education. 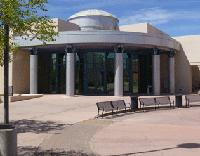 With the establishment of the University of New Mexico Center on Aging in 1988, the University recognized the need to strengthen geriatrics and gerontology in New Mexico. The Center, directed by Dr. Carla Herman, provides an infrastructure for geriatric/gerontology activities within the University. The interdepartmental faculty and staff use the Center for implementing the Reynolds Foundation Interprofessional Geriatric Educational Program. The Center on Aging is a convenient location off-campus, which provides easy access to our collaborative partners in Albuquerque.